Nice, smooth and very easy drinking white wine......and really good value. We tend to drink this as a pre-dinner wine, but also goes well with food (especially chicken, pasta dishes etc). Thoroughly recommend! 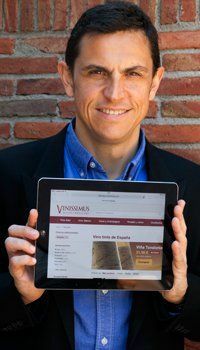 In 2005 Toni Vicens, a wine enthusiast and keen web programmer, set up Vinissimus with barely 100 wines in the catalogue. Today, after more than a million bottles of wine sold, 80,000 orders processed and 102,000 clients all over Europe, Vinissimus operates sites in 5 countries, has 6,800 listed references and is the leader in online sales of Spanish wine in Europe. At Vinissimus we take great care over each order to make sure that all goes to plan and that our customers receive their wines as soon as possible. Our own in-house technology for handling orders and our personal approach towards customer service work in tandem to provide total satisfaction. If one of our products arrives in poor condition or you are simply not satisfied with it, you can return it to us with peace of mind. If a bottle breaks during transit, Vinissimus will ensure that another one is sent out to you. Orders for the Spanish mainland are delivered within 2 to 3 working days of being placed. For the Balearic Islands, the delivery time is 3-4 days, and between 4 to 6 days for most destinations in other European countries. If the wine is in stock and the order is placed before 1pm Spanish time, it can be delivered to you in the UK 4 days later.